A High Street health food chain says it has had to order extra stocks of rosemary after research claimed the scent of the herb could improve the memory of students revising for exams. Holland & Barrett says there has been a 187% increase in sales of rosemary essential oil compared with last year. A Northumbria University study showed pupils in a room scented with rosemary performed better in memory tests. 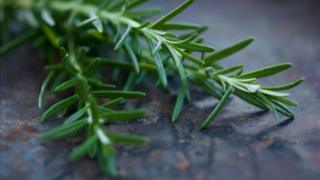 It supported the traditional links between rosemary and memory. A spokeswoman for Holland & Barrett said that after the research about rosemary was published "we saw a sharp rise in customer demand". "As the exam season continues, we have increased provision in store to meet demand," she said. The rush for rosemary saw almost a doubling in sales compared with the same time last year and a trebling compared with the previous week. Hundreds of thousands of pupils are revising and taking GCSEs and A-levels - with the suggestion that the spike in rosemary sales has been driven by anxious parents trying to find a way to help their children. The research from Northumbria University, presented at the British Psychological Society's annual conference, backed up historical associations between rosemary and memory. It suggested that pupils who worked in a classroom with the aroma of rosemary oil achieved 5% to 7% better results in memory tests. Researcher Mark Moss said the human sense of smell was highly sensitive and sent messages to the brain, setting off reactions and responses. "It could be that aromas affect electrical activity in the brain or that pharmacologically active compounds can be absorbed," he said. Rosemary has been connected with memory for centuries. In ancient Greece, students wore garlands of rosemary in exams and in Shakespeare's Hamlet, Ophelia says: "There's rosemary, that's for remembrance."